Attack hose is often used by the fire brigade of government and major industry, often assembled with the fire engine. Its warp is made by high strength polyester staple or filament. And weft must be high strength polyester filament with low elongation. The jacket should be evenly and firmly woven by circular woven machine and free from visible defects, thread knots, lumps and irregular twist. 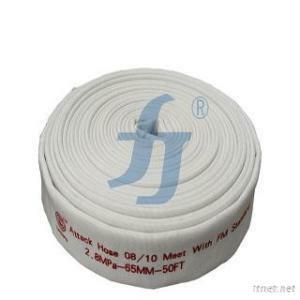 Its inner lining is the finished cure EPDM hose with non-osmotic. Between the lining and out jacket is the special solid or liquid adhesive, so the adhesion strength is very high. EPDM fire hose has good oil resistance, acid, alkali, aging and ozone proof, anti-ultraviolet and corrosion. Commonly used for fire prevention place and high temperature liquid transportation of petroleum or chemical products in developed countries.